KAMPALA– The Buganda Road Chief Magistrate court has charged three Makerere University students with allegedly trespassing at the entity’s premises and taking part in an unlawful assembly. The group appeared before Grade one magistrate Joan Ketty Acaa to have the charges formally read to them. They however denied all charges against them and were subsequently granted a cash bail of Shs200,000 after court retaining their National IDs as surety. Frank Bwambale, David Musiri and Roy Rugumayo were suspended by the University on September 12, 2018 when they were allegedly found in the University’s Nkrumah hall of residence assembling in a manner suspected to invoke other students cause a breach of peace. 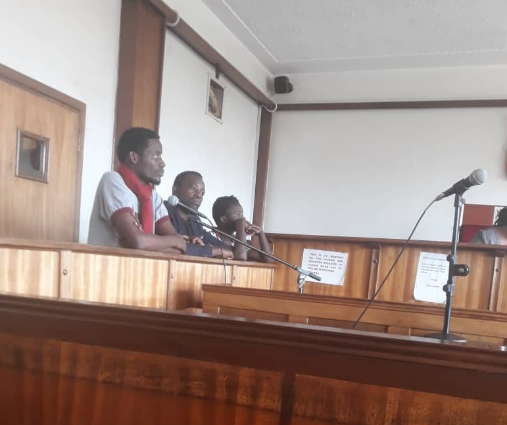 The trio that have been ordered to return to court on October 4, 2018 to start trial, is said to be part of a group that masterminds a series of riots to protest the 15% tuition increment by the University. Several students had rejected 15 per cent tuition increment and had vowed to protest once it is passed by council. However, Makerere University Council approved the increment which is set to affect new students scheduled to join the institution in August. This followed the Student Guild leadership proposal of 15 per cent increase to the university council to consider after they protested the 45 per cent and 91 per cent raise that had been proposed by the council earlier this year.